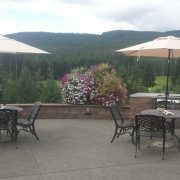 Pristine views and a beautiful brand new dining experience have enlightened the patio at Gold Mountain Golf Club. When you visit the restaurant at Gold Mountain, you will be welcomed with brand new tables, chairs, lounge furniture, umbrellas, and the beautiful scenery of the Olympic Mountains. The ambiance of the outside deck will ease your day and brighten your spirits, regardless of how your round may have gone. Speaking of spirits, you can sip on a local craft beer or one of our signature cocktails, like our freshly muddled strawberry mojito, while you take in the views around you. The Gold Mountain menu consists of fresh ingredients and tasty treats, and everything is made from scratch right here in our very own kitchen. Take some time to come and enjoy our dining experience at Gold Mountain Golf Club. Perfect for delicious food after a round of golf, or just a casual night on the town. Join us on Easter Sunday for our spectacular buffet at Gold Mountain. Bring your family and friends to celebrate with you and make it a day with the whole family! Upon your arrival, you will be greeted by the friendly staff and elegantly decorated tables, which festively showcase the Easter Holiday. Start your meal with a craft brew, glass of premium wine, or mimosa and prepare for the delicious buffet to come! Our buffet features traditional items inspired by everyone’s family favorites, and several dishes highlight spring flavors, fresh herbs, and masterful creations from our very own Executive Chef, Jon Forcier. Our Sous Chef, Trevor Nelson, will feature a build your own station, including omelette’s and waffles with ingredients to make your mouth water! 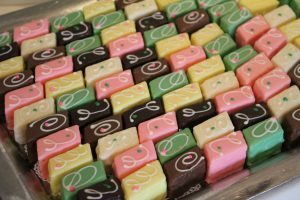 Our dessert bar is stocked with a variety of cakes, pies, cookies, petite fours, and other goodies. So you’ll definitely want to save some room for dessert! Gluten-free desserts are also available, to ensure no one misses out on this beautiful spread. Reservations are required, visit the restaurant or call 360.415.5432 to reserve your table. Large parties are welcomed and separate checks are no problem! The Hero Sandwich has a lot of history in the United States. The ultimate question is, where did the Hero Sandwich originate? There seems to be one story that stands out from all the others, and it leads to the assumption that the sandwich originated in Italy from Italian immigrants who brought the idea to our East coast in the early 19th century. The Italian’s combined fresh salami, pepperoni, prosciutto, and Mortadella cured meats as the heart of the sandwich, while traditionally adding lettuce, tomato cured meats, and Provolone cheese to round it out. American’s typically enjoy mayonnaise on their sandwich, while Italian’s substituted oil and vinegar as their main condiments. In Boston, the Hero is known as a sub sandwich, or a submarine sadnwich, because of the shape of the bread. In New Orleans, it is known as a Po’boy and has many meat and seafood variations. But here at Gold Mountain, our Hero Sandwich has slow cooked pork roast that is dry marinated in our house spice rub. 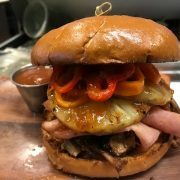 Then topped with thinly sliced black forest ham, grilled pineapple rings, house-made pickled peppers, and our sweet and spicy hero barbecue sauce. Ingredients are piled high on a fresh brioche bun and served with our house-cut French fries. Trust us when we say, you’ll be telling your friends about this! So no matter where you are eating your Hero Sandwich it will probably be a little different than the place before, but we have a feeling Gold Mountain’s is the one you will always remember! Gold Mountain Introduces Team Member of the Quarter! Gold Mountain’s Team Member of the Quarter recognizes a team member who brings forward all of our values. Enthusiasm, respect, creativity, honesty, sincerity, and accountability. This team member is voted for by the entire team in all departments, and is recognized at our all staff quarterly meeting. This quarter Denise Garza was voted to become Gold Mountain’s very first Team Member of the Quarter! Denise’s outstanding qualities and contributions to not only Gold Mountain, but to Columbia Hospitality as a whole, have caught the attention of every team member that has the privilege of working beside her. Denise started working at one of the Columbia Hospitality properties in 2006, McCormick Woods Golf Club. At McCormick Woods Denise was the leader of the Snack Shop, lead dining room assistant, banquet server, and housekeeper. Denise has always risen to any challenge with great enthusiasm and positivity. In 2016, Denise was promoted to Snack Shop Supervisor at Gold Mountain Golf Club. Denise has very successfully lead the beverage cart and Snack Shop teams. The addition of The Den helped lead Gold Mountain to records in our food and beverage department. Denise is also part of the dining room assistant team and banquet team at Gold Mountain. 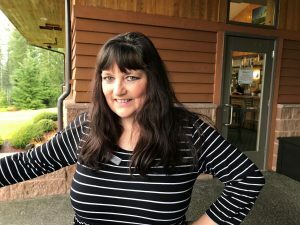 Most recently, Denise has been asked to join a third Columbia Hospitality property, Kitsap Conference Center as a banquet server and concierge. 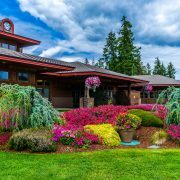 Denise has exhibited continued and unwavering professionalism, dedication, and sincerity throughout her time at Gold Mountain Golf Club. Her calling is truly hospitality and we are extremely grateful to have Denise on our team. Her leadership, honesty, and creativity are contagious among guests and team members alike. I am so proud of Denise Garza and grateful to be a part of her continued growth and success. https://goldmountaingolf.com/wp-content/uploads/2017/11/Gold-Mountain-Club-House.jpg 3000 4500 teesnapdev https://goldmountaingolf.com/wp-content/uploads/2017/04/goldmt-logo_2Color_transparent-1-e1493064764505.png teesnapdev2017-11-10 18:29:322017-11-16 18:05:44Gold Mountain Introduces Team Member of the Quarter! Gold Mountain Golf Club is getting ready for the holiday season with great specials on golf, beautiful décor, and fun holiday parties. Every year we host some amazing groups for their holiday parties and this year is shaping up to be no different. We love the holiday season and would love it even more if we could spend it with you. 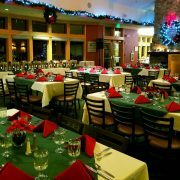 There are still dates available for you to host your family, friends, or even corporate holiday party at Gold Mountain Golf Club. We can host intimate groups of 20 guests or large events up to 200 guests. There are packages available to fit any budget and every style. All of our holiday packages are priced per person and include some fantastic food choices as well as room fees, tables, chairs, linens, holiday décor, tax and service charge. You can actually enjoy your event too, because we provide a friendly and attentive staff member to make sure you and your guests have the best event possible. 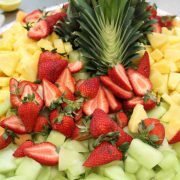 Gold Mountain welcomes everything from large business events, close family events, and beautiful winter weddings. If you are interested in booking your event with us please contact Jesse McGee, Sales and Event Planning Manager, at 360.415.6894. We had the pleasure of showcasing our portable “Taco Truck” stand in August at our beautiful sister property, Kitsap Conference Center. It was a picturesque day at the Bremerton Harborside Marina, with the sun shining and over 700 guests in attendance. The fountains added the perfect backdrop to our booth. Guests enjoyed many different local wineries as well as a few local breweries. Live music from The Tones kept the vibe fun and exciting! 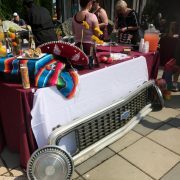 Almost every guest had one of our chorizo taco’s in hand as they made their way through the crowd. Executive Chef Jon Forcier, prepped our spicy chorizo, cotija cheese, pickled peppers, onions and cilantro; enough to fulfill the demand of 1,000 tacos. Cook, Chris Mitchell, along with Restaurant Supervisor, Jennifer Couch, fed the hungry guests for over four hours. The line to our booth was never less than 15 guests deep. Jennifer and I had a great time conversing with the lively crowd, inviting them to come try our street tacos, and handing out coupons for those who wanted to come join us outside of the festival. The chatter over our “Taco Tuesday” promotion could be heard amongst the guests waiting in line, and was quite exciting to hear. Every Tuesday from 11am to close we offer a rack of five chorizo street tacos for $8, as well as margaritas and bottled corona for just $3. 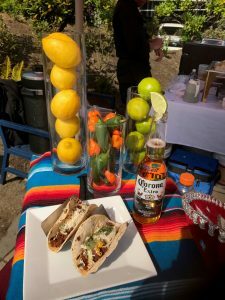 Golfers keep your eyes open for our Gold Mountain Taco Truck to be added as a menu option for on course food stations during golf tournaments in 2018! Our robust menu is still an exciting feature here at Gold Mountain and we welcome all to come join us in our public restaurant seven days a week. Thank you for being a part of our culinary excellence!